The water is cold and clear. Is it fit to drink? Why are large springs blue? Are all Missouri springs freshwater? How can I protect the springs? A spring is a water resource formed when the side of a hill, a valley bottom or other excavation intersects a flowing body of ground water at or below the local water table. They range in size from intermittent seeps which flow only after much rain to huge pools flowing hundreds of millions of gallons daily. Springs may be formed in any sort of rock. Small ones are found many places. 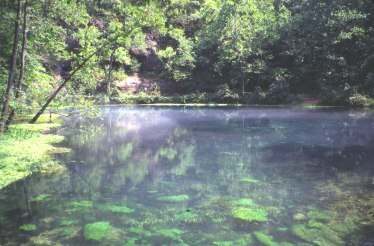 In Missouri, the largest springs are formed in limestone and dolomite (a magnesium bearing limestone) in the karst topography of the Ozarks. Both dolomite and limestone fracture relatively easily. When weak carbonic acid (formed by rainwater percolating through organic matter in the soil) enters these fractures it dissolves bedrock. When it reaches a horizontal crack., or a layer of non-dissolving rock such as sandstone or shale, it begins to cut sideways, forming an underground stream. As the process continues, the water hollows out more rock, eventually admitting an airspace, at which point the spring stream can be considered a cave. This process is supposed to take tens to hundreds of thousands of years to complete. The age of a spring or cave is difficult to estimate due to the variables of rock composition and water volume doing the work. Also, because a catastrophic event may cause a rock collapse in minutes which would have otherwise taken centuries, all age estimates are very general. Most of the water in a given spring comes from the immediate vicinity; all of it comes from what is known as the spring's recharge area. A one inch rain on one acre of ground yields 27,192 gallons (.0421 second feet)of water. Considering a 42 inch annual rainfall for Missouri, each acre receives 1,142,064 gallons (1 .77 second feet) of water annually. Some of this water runs off into surface streams and creeks, and some goes into the ground. In the Ozarks, a higher percentage goes directly into the groundwater system than north of the Missouri River. Once there, some is stored and some is released immediately by the springs. This accounts for higher springflow after rains, and is known as surge flow. Base flow is that stored water which is released more slowly, and keeps springs flowing even during drought. Many tracing studies have outlined the recharge areas for the springs. This is valuable information in case of a pollution spill which reaches the groundwater of an area. This water is cold and clear. Is it fit to drink? NO!!! The temperature of an Ozark spring comes from its passing, through rock at the mean annual temperature of 56 degrees Farenheit. The water temperature varies with the seasons and the rate of flow through the underground channels, but except in times of flood or snow melt, it usually varies only a few degrees above or below 56-59 degrees. The water is crudely filtered in the rock, and the time spent underground allows debris and mud to fail out of suspension. If underground long enough, lack of sunlight causes most algae and water plants to die. However, microbes, viruses, and bacteria DO NOT DIE just from being underground, nor are any agricultural or industrial pollutants removed. While the water may be less contaminated than that from an industrial river, no untreated water is truly safe to drink. A column of distilled water is colorless. Various impurities, even naturally occurring minerals, cause a column of springwater to reflect light as greenish, aqua or deep blue, depending on the depth of the water and amount of impurities. After heavy rains, many springs are milky, murky, or muddy because the sediment has not settled due to the amount of water and the speed at which it is flowing. Springs are not sterile. Permanent spring dwellers are those plants and animals which require cool (less than 70 degree F.) constant temperature water of more than usual clarity, and often high oxygen levels. Among these are water snails, amphipods, isopods crawfish, salamanders, sculpin (a fish) and beaver. During hot weather, many animals seek relief in the cooler temperature of the water. River otter, rainbow and brown trout are introduced species which thrive in springs; several major springs are fish hatcheries and fishing resorts based on trout. People have used them as permanent water sources, refrigeration, and watercress farms. The underground streams which feed the springs are home to several species of rare and protected cave animals, such as blind, albino fish and crawfish. Are all Missouri springs fresh water? No. Missouri has quite a number of salt and mineral springs, which would be brackish to the taste. Several of these in Jefferson and Ste. Genevieve counties were used by early settlers to make salt. Others, like those at Excelsior Springs, Mo., were very popular as medicinal baths during the 19th and early 20th centuries. One freshwater spring, Welch, was used as a health resort for lung ailments early in this century, by a Dr. Thomas Diehl. He encouraged his patients to come take advantage of the good water and cool cave air--but the venture was never successful. This old farmer's tale refuses to die. Because the water is translucent and rather deep, the bottom cannot be seen. Someone weights a rope with an anvil or other heavy object to sound the bottom, which is muddy or sandy, then lets down the rope. One of two things happen. Either the anvil grounds so softly the person on the end of the rope does not know it and continues to play out rope to the end, proving it "bottomless" or the anvil does not touch bottom because of the great pressure of water squirting out a small hole, just like a fire hose can be used to move heavy objects with its force. Most springs have an orifice (sometimes clogged with boulders) thru which the water flows. Beyond this bottom of the pool opening divers with proper gear can continue to the limits of their air as well as equipment, stopping only when the passage becomes too small. This diving is most dangerous and illegal without permisson in most of Missouri's springs because of the hazard involved. But they have proven that springs are not "bottomless". Learn what you can about them. Visit them and treat spring basins gently. Most of the biggest and best are on public land. Understand where the water comes from and that "garbage in" on the surface of the land becomes "garbage out" of the springs. Don't put trash in sinkholes. Property dispose of chemical, sewage and other waste. Pick up litter and think twice about dumping stuff on the ground. Become aware of industrial plans to develop an area without regard to the groundwater. Take pictures and spread the word that freshwater springs are one of our most valuable resources, in these days of dwindling good water supplies. Help the environmental agencies (National Park Service, U.S. Forest Service, Departments of Natural Resources and Conservation) with their charge to preserve and protect these Ozark jewels. And take time to enjoy each one yourself--then pass that joy to a child to ensure the future of this resource. This page last updated on May 2, 2006. Return to Missouri Springs homepage.